Carolyn Kim, professor of public relations, is an award-winning scholar, educator and PR professional who has been instrumental in building Biola’s public relations program. On Oct. 8, at the Public Relations Student Society of America (PRSSA) national conference, Kim received the Faculty Adviser award for the Dr. F.H. Teahan Chapter Awards. Biola’s public relations program has doubled in student enrollment under her leadership and continues to increase its competitive edge through student-run programs like 6th Street Public Relations and the Biola Public Relations Student Society of America (PRSSA) chapter. Since becoming the faculty advisor for Biola PRSSA, three students have served on the PRSSA National committee and the chapter has consistently achieved the Star Chapter Award. In light of all these accomplishments, Kim was awarded the Distinguished Service Award from the Orange County Public Relations Society of America in 2016. 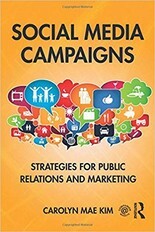 Kim released her first book, “Social Media Campaigns: Strategies for Public Relations and Marketing” in 2016 and she is currently writing her second book set to be published in Spring 2019, “Public Relations: Competencies and Practice.” In 2017, Kim received a grant from the Arthur W. Page Center to conduct research on trending issues in the digital media space, was named the Chief Research Editor of the Institute for Public Relations Digital Media Research Center, and was named a Kopenhaver Center Fellow of the Lillian Lodge Kopenhaver Center for the Advancement of Women in Communication. Kim continues to develop new curriculum for the PR major and is a key motivator behind new concentrations for Fall 2018 and 2019 that support career paths for students. She’s also well known by students for regularly bringing in homemade cookies to her office and having a deep passion for chai lattes. Here, Kim shares more about her current research, projects, and new concentrations within Biola’s public relations department. You are the Chief Research Editor of the Institute for Public Relations Digital Media Research Center. Can you share more about that and the work you have been doing in that role? This is an opportunity of which I am particularly proud! In this role, I have the privilege of working with leading public relations professionals and subject matter experts to highlight the latest trends, standards and research in the area of digital media. Essentially, the Digital Media Research Center is the go-to place to find out how digital media is influencing PR. I get to connect with so many outstanding people and also am constantly learning more about the world of digital technology. My job is to help showcase premier research findings by scholars as well as thought-leadership blog posts by senior leadership within PR. It’s an amazing role! 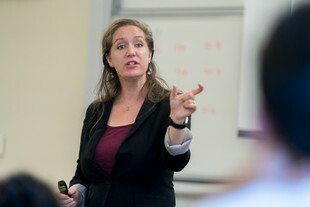 Can you share more about the research you conducted with the first grant you received from the Arthur W. Page Center? My colleague, Karen Freberg from the University of Louisville, and I were honored to receive this grant. A growing trend in social media is that organizations will be able to immediately help people resolve situations — for example, people who may be having trouble with an airline or disappointed in an experience at a restaurant. Many people actually expect organizations to respond within 60 minutes after posting a complaint to social media. In light of the growing use of social media to directly communicate with brands, organizations have launched social care centers — or a team entirely dedicated to helping engage with customers through social media. As more people use social media to resolve situations like this, it is important to understand the ethical duties and obligations that are present. We’re looking at what people expect when they interact, what organizations perceive as their ethical obligation and how a mutually-beneficial communication climate can be maintained when social media is used in this manner. Social media is a huge part of life for brands today. With people now using it to resolve significant issues in the brand/public relationship, ethical guidelines become quite important. Should businesses be taking more consideration of social care ethics based on any early findings or from your professional opinion as you look at this segment of the industry? One of the things we talk about in PR is our duty or obligation to preserving a mutually-beneficial relationship. With digital technology, it can be easy to lose sight of the human element to communication. It’s not programmable or automated. It needs to be customized, based on individual situations, and really reflective of the individual's experience. Anytime organizations are interacting with people, it is important to have a solid understanding of the ethical role of communication and our duty to key stakeholders. Career paths within PR have expanded to include digital technology. How has this impacted student career paths and the PR major? We are launching a concentration in Digital Management & Social Media. Social media and digital technology revolutionized the public relations discipline. While social and digital jobs are often identified as some of the fastest growing (and changing) opportunities for our new PR graduates, there is also an increasing expectation among educators that PR curriculums address digital competencies. To provide a robust and competitive educational experience for those students in our PR program wanting to specialize in digital and social media, we have re-imagined the curriculum to facilitate a more comprehensive competency in the discipline. Our new concentration is specifically designed to equip students to effectively engage, manage and strategize initiatives between organizations and their stakeholders in creative ways. At the end of the day, this all happened as we saw more of our students getting internships that desired these skills and our graduates shared with us the need for greater training in digital PR. PR plays an important role in how the public views an organization or person as credible. What have you found in your research related to the current cultural climate in the United States? Credibility is a really interesting concept. It’s fluid — meaning it is based entirely in someone’s perceptions. Scholars generally agree that credibility has a couple key areas that people consider. First, whether someone is an expert in the area they are claiming. Second, whether the person is trustworthy. Third, whether the person actually cares about the individuals with whom they are interacting. Today’s climate in the U.S. shows a steep decline in public trust. There are many reasons that this has come about: failed morals in our leaders, the rise of fake news and a general disillusionment with the integrity of leaders. This absolutely results in damaged perceptions of credibility as well. We really need to focus on developing trust if we hope to see a change in the perceived credibility of leaders, organizations and businesses. It’s where it will all start. If a student is considering public relations as a major or career, what would you encourage them to think about when entering the field? Public relations is an amazing field, especially right now. It’s a job that has so many different flavors — there really is a place for everyone. We live in such a global economy that every kind of organization needs a PR person — whether it’s a major league sports team, a start-up, a large corporation, a church and so many other types of organizations. I tend to ask students what they love so much that they’d be excited to wake up every day and help others be part of the organization too. There is no one-size-fits-all job in PR. People can do so many different things and use a variety of skills and passions in this industry. I’ve seen so many kinds of personalities succeed in PR. I love helping people find their fit! Why do you love teaching PR at Biola? There have been so many times that people have told me they had no idea that PR was even a major — it is just a combination of everything they love. If I could do one thing, it would be to help more people understand the variety of options and the many potential career directions that a major in PR can give. 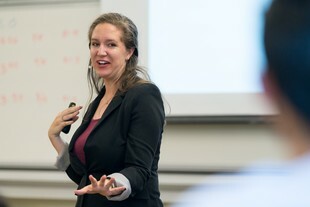 I want to see people connect with their passion and calling — and by teaching at Biola, I have the privilege of doing that as a regular part of my job! Learn more about Biola’s Public Relations program.